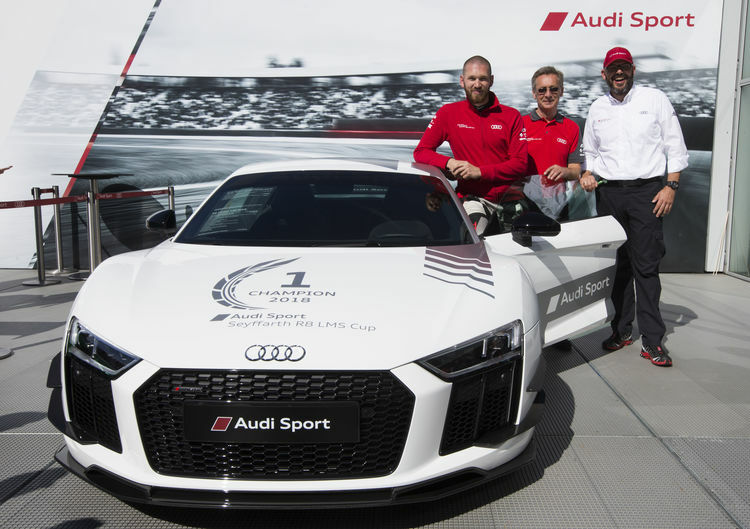 While Audi Sport customer racing decided the Eset V4 Cup in Central Europe with Team Olimp Racing and Marcin Jedliński in its favor Kris Heidorn celebrated the title in the Audi Sport Seyffarth R8 LMS Cup at the Nürburgring. Title success in Central Europe: Marcin Jedliński in an Audi R8 LMS won two titles in the Eset V4 Cup. In the finale of the Central European racing series on the circuit at Brno in the Czech Republic, the Polish race driver from Team Olimp Racing together with his compatriot Mateusz Lisowski won the endurance race in an Audi R8 LMS. In the endurance race standings, Jedliński is ranked in position one, trailed by Lisowski. Jedliński in his debut season won the sprint classification in an Audi as well. Second place in the standings went to Richard Chlad jr. The Czech drove an Audi R8 LMS ultra, took second place in his class in sprint one at Brno and won his classification in the second sprint. Audi top-class at the Sachsenring: The sixth race weekend of the ADAC GT Masters has been the most successful one for the Audi Sport customer teams to date. On the roller coaster track near Hohenstein-Ernstthal, the customers celebrated a one-two-three success on Sunday. Elia Erhart/Pierre Kaffer achieved the first victory of the newly formed EFP by TECE team with a sensational fightback from P27 on the grid. Like the day before, second place with a gap of just three tenths of a second went to brothers Kelvin and Sheldon van der Linde from Montaplast by Land-Motorsport. Trailing them by three more tenths, BWT Mücke Motorsport completed the podium with Jeffrey Schmidt and Stefan Mücke. With that, Kelvin and Sheldon van der Linde managed the leap from seventh to fourth position in the standings. Before the finale, the two South Africans are separated from the leaders of the standings by 20 points. 50 points are yet to be award at Hockenheim two weeks from now. In addition, their team, Montaplast by Land-Motorsport, improved to third place in the teams’ classification. In the juniors’ classification, Sheldon van der Linde moved into the top spot, trailed by three other Audi privateer drivers, Philip Ellis, Max Hofer and Jeffrey Schmidt. Lead of the standings maintained: On the fourth race weekend of the GT Sweden, Jan Brunstedt only needed a podium finish to stay in front. The Swedish gentleman driver on the occasion of the series’ visit to Norway finished the first race runner-up in an Audi R8 LMS ultra on the circuit at Rudskogen. As a result, Brunstedt has a 25-point advantage in the standings before the finale at Mantorp Park in two weeks. Two successes in China: Team Kings has continued its winning streak in the China GT. On the fourth race weekend at Shanghai, Xu Jia from China and the Belgian Alessio Picariello in an Audi R8 LMS won both races in spite of 50 kilograms of ballast weight for previous successes. Thus, the Chinese customer team remains unbeaten in this series in the 2018 season. Xu Jia is now leading the standings with a 33-point advantage while Alessio Picariello is ranked in position three. In the GTC class for Cup race cars, Jeffrey Zee and Jason Zhang in an Audi R8 LMS took third place in race one. Victory in Australia: In round 6 of the Australian CAMS NSW Motor Race Championship club sport series, Audi privateer driver Daniel Gaunt celebrated a victory. The New Zealander won the first race at Wakefield Park in the Australian state of New South Wales. The Audi R8 LMS of Team KFC crossed the finish line with a 15-second advantage. Third place in Italy: Audi Sport Italia at Vallelunga celebrated its fifth podium result this season. In round five of the Italian GT Championship, Bar Baruch and Mattia Drudi achieved third place in an Audi R8 LMS in race one. As a result, Baruch, with two more events yet to be held, is ranked in position four of the drivers’ standings.